Looks like a beautiful book. Thanks for the review. Thanks for the post. Ordering the book now. Rats! I can’t seem to find it in the US. Any info on a US release? For international inquiries click at the button “Enquiry: at the top of the above link. Excellent review! Makes me want to buy the book asap even if I have no idea wether I’ll try the techniques described ;o) Thanks too for making me discover these amazing online libraries!!! Thank you for this review, it looks fantastic. I will look for this the next time I am at the FIT bookstore in NYC, which is a good source for books like this. Lovely review of what is certainly a fabulous book, Els. Thanks for telling us about it. wow, dat is een geweldig boek. Dank je wel voor deze info. Thank you Els – this book looks really inspiring and I’m hoping I can get a copy from the Belgian website. More reviews please! Thanks for this info Els. I contacted the Customer Svcs and they responded the next day (today). We are now working on the best (cheapest) way of shipping this to me, hope to have it here soon. You are the best resource… ordered the book and was sent a Proforma invoice. Any idea how I pay it??? Susannah, you could just send your cc information along with the expiry date and your Proforma Invoice #. That’s what I did last night, no names or address and I deleted the other contents of the mail. I just received a mail thanking me for my payment and my book is in the mail tomorrow. Forgot to add: on the Invoice are payment options, the one option not included was Paypal. The book is glorious; it’s going to be mine soon. Maybe even sooner than that! hi rito, yes this book literally spoon feeds you through the process so no basic skills are required it’s that simple !!! 3. preparation before draping includes dressform fabric materials working space taking measurements, style lines how to make a arm for a dressform with or without shoulder!! 12. famous fashion designer like christian dior yves saint laurent and their designs step by step so you can put everything you’ve learned from this book to the test. 13. dictionary etc etc .. Thanks Barbare for adding the index of the English book. I contacted two website, and neither responded to my Enquiry. I also really want this book, can you also contact me and let me know how to order one please? I found out from the publisher that this book is now out of stock and in reprint, so they are waiting for a new stock. I have no idea if they ship outside The Netherlands but you can sent them a mail with your request info@boek.net. THANK YOU SO MUCH, I ORDERED THE BOOK AND ITS ON ITS WAY FROM BELGUIM. DOES IT SHOW YOU HOW TO DO A MOULAGE OF THE DIOR DRESS SHOWN ABOVE? I REALLY WANT TO LEARN THE TECHNIQUE OF THE PADDING. 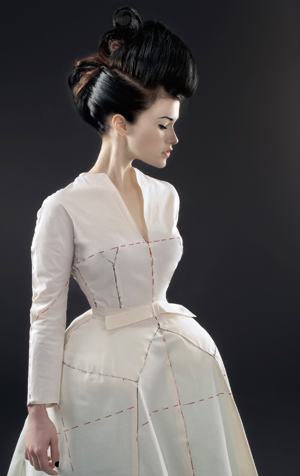 Yes the book shows how to do a moulage for the Dior dress as seen above including the padding for the hips . The moulage for that dress contains 27 step by step pictures and text. As soon as we receive your order we will send you a ‘proforma’ invoice, a payment request with the correct amount and references. The easiest way to pay is per credit card (amex, visa,…). After we have received your payment your order will be shipped. For any enquiries please contact orders@exhibitionsinternational.be. I really want this book, but I was informed that this first edition sold out, I’ll have to wait for the second edition. I found it on e-bay, but this absurdly expensive! Thanks for sharing the information on the existence of this book. Thanks for the gorgeous reply on my blog. Very nice your work too! I have just ordered this book through amazon and I can’t wait. I have been looking and looking and looking for a draping book. I have the Kenneth cole moulage cd on how to make a moulage for any body, but I was lacking information on what the next step was, i.e draping on the form created with the moulage. I am hoping this will bridge that gap that I have and have been wanting to bridge for so, so long. I have been sewing since I was a child, so I don’t lack sewing skills. As some one mentioned I will keep my house spotless, laundry done, etc so that when the book comes, I will have no backlog of housework to be done!!!! If I think this book will do what I think it will do, well… I can’t wait!!!!! I find that a lot of books out there, teach you how to sew, how to make a moulage, how to make patterns, but they all seem to be so disjointed, not giving you a full course on taking you from a, to b, to c. You have to figure it out all for yourself. I live too far to be able to do any courses, so I’m basically self taught. It would be nice for someone to create a list of resources (maybe from some professional that is not affiliated to any of the resources) to take home sewers from one level to the next (even if there are several books for the same level), some structure for people to follow? Just an idea for someone out there with the knowledge and know how on putting something together. I seriously can’t wait now! i have a technical question. when we prepare the toile for the fitted dress (pg 80-81) how do we measure and mark the hip height on the flat cloth. do we measure from the neck point to the bustpoint straight down to the hip line? if i take in the tape slightly below the bustpoint due to the underbust curvature and then follow the natural curve of the abdomen and hips in the front my hip height will increase obviously.which is the correct way to measure? or should i hold the tape against the side seam of the dummy and measure from bust level to hip line? each time i get a different reading. although its like one fourth inch here and there,i would like to know the exact way to do it.please, if anyone has done the dress on the stand? I presume that you are making this toile on a dress model. Did you do all the measurements and pinned the tapes at the permanent help-line tapes on the dress model? Measure the length at the center back from the bw line towards the hh line and mark that line on the toile. Those lines on the toile are guidelines because they need to correspond with the permanent help-lines lines on the dress model. If you are measuring the HH from the BW line on the side seam in a straight line there will be a shortage due to the inward curve from the bust line to the waist and the outward curve from the waist to the hip line. If you never drafted a pattern before then I would suggest start with a simple garment first, like the straight skirt see page 40 to get some practise with moulage technique. Just like in pattern drafting skills, a skirt is the first garment you learn.